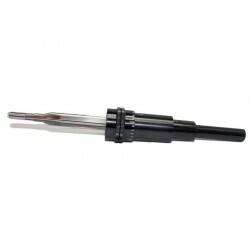 Our Chamber Reamers are individually hand-stoned to cut smooth and chatter free. Made to CIP / SAAMI specifications or custom specifications for standardized cartridges and to the current industry standard for popular wildcat cartridges. All HSS reamers have a 3/8" square drive shank. Carbide reamers feature a .4375" cylindrical shank. We can grind a square drive on a carbide reamer, but we do not recommend driving a carbide reamer with square drive - the carbide tends to chip and/or shatter. Premium reamers feature removable pilots that are held in place with a screw. 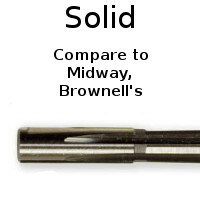 Premium reamers include one bushing of nominal bore diameter. This Chamber Reamer is available with Solid Pilot. 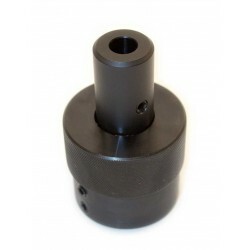 Call for pricing on a Carbide Reamer with special oil-groove pilot.